It’s the go-to resource that provides all the information your employees need to know about their workplace. 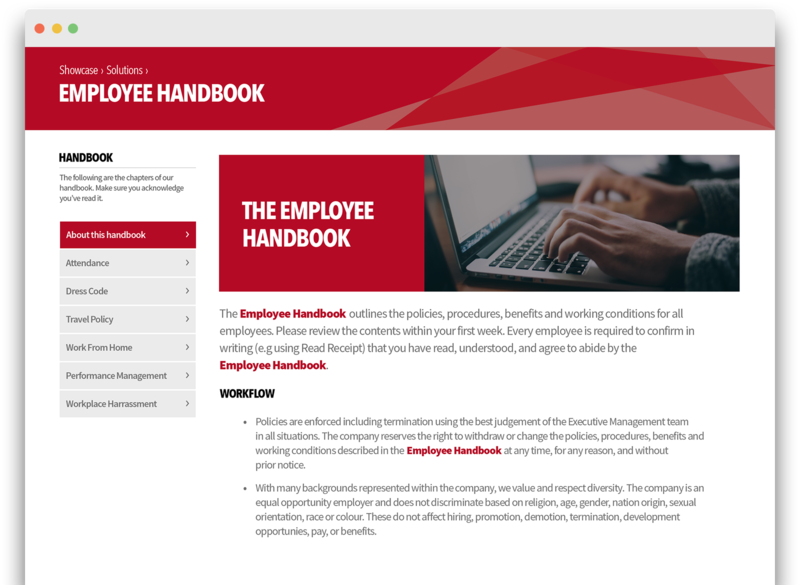 The Employee Handbook organizes source content in a visually appealing, chapter-like experience that allows your culture and visual identity to shine. It’s scalable, trackable, and presented in a way that fits with your brand and culture. Instead of a native wiki experience, where articles are presented alphabetically, Igloo’s Employee Handbook offers a chapter-like format so you can arrange and serve up content in a more user-friendly way. Administrators can surface the content of any wiki article in any space or page they choose – and when the original article gets updated, it’s updated in every instance. With an “acknowledge” button on articles, users can confirm they’ve read and agree to the terms outlined in policies, waivers, and registrations. And because wiki articles have a version history and tracked changes, users can be notified of changes or comments. Display wiki articles and other content in a format that suits users. Control versions and track articles. Ensure there’s only one source of truth.